Home Business: What Are The Benefits? You are here: Home / Business / Home Business Tips / Home Business: What Are The Benefits? Working from home is something that many people desire. A lot of people think it sounds good, but just are not sure if it is for them. There are quite a few benefits of working at home. If you have been thinking of taking the plunge and starting your own home business, the following article will share some of the reasons many people choose this option in their life. First of all, when you work from home, you are your own boss. There is no one for you to answer to except for yourself. Many people do not like having a boss, and when you work at home, you will not have anyone telling you what to do. This could be a good or a bad thing. If you are not driven to do what you need to do when it needs to be done, you may have a hard time not having a boss so you need to keep this in mind. Another good thing about working from home is you can work when you want to work. Time is something that we cannot change or get more of. When you work from home, you are able to be more in control of your time. Working a 9 to 5 job requires you to be at work certain hours during the day. Running your own home business gives you the option of working the hours during the night or day that you choose. You are able to work around your other family member’s schedules and this can be very advantageous. Another good thing about being able to be the master of your own time is that you are able to do more of the things you enjoy. You do not have to waste time driving back and forth to work, and you can spend more time with your friends and family if you choose. When working for yourself, you know that all the money you make is yours. Working in a big company, you never know where the money you help make is going. It can be a great motivator to work a little harder if you know that your extra work will mean more money in your pockets. For this reason, many people enjoy working for themselves. If you enjoy hanging out at home in your pajamas, this is another good reason to work from home. Doing your work at home allows you to wear whatever you are comfortable in. You do not have to dress up just to do the work that you need to do because you do not have to see anyone besides the people that live in your home. Working from home has many advantages. 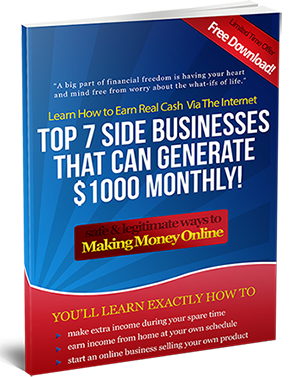 You have just read about some of the opportunities you are afforded to you when you decide to work for yourself from the comfort of your very own home. Use this information to help you make the decision that is right for you and your family.